John Romanowich, one of Princeton’s most successful entrepreneurs, held court this morning in the name of Einstein’s Alley. More than three dozen people – officials and well-wishers gathered at his place on Alexander Road to take formal note of the fact that his company, SightLogix, is doing well and for good reason. The company’s recent contracts include major perimeter security deployments in the Middle East, contracts with NJ Transit, Port Authority of NY & NJ, Lockheed Martin, and several national air and seaports. It also has new offices in London and Bangalore. Romanowich was also able to talk about finishing a large U.S. Dept. of Homeland Security contract that places rapid-response surveillance equipment in the hands of first responders across the nation. Romanowich has co-founded an ad hoc support group for high tech entrepreneurs in the Einstein’s Alley area, loosely defined as central New Jersey. But it is the official Einstein’s Alley group, led by Katherine Kish and Lou Wagman, that invokes the Albert connection to actively market the five-county area as The Place for high-tech technology firms to settle and/or to expand. 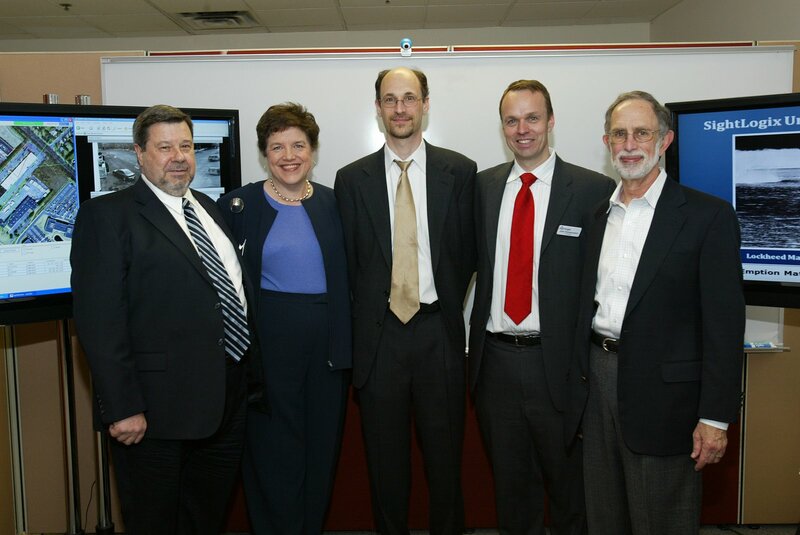 Pictured, left to right: James Hahn, Chairman/Founder SightLogix, Katherine Kish, Co-Executive Director Einstein’s Alley, Eric Heller, Marketing Director SightLogix, John Romanowich, President/CEO/Founder SightLogix, Lou Wagman, Co-Executive Director Einstein’s Alley.